There is an artist within every person. Yes, I’m talking to YOU! 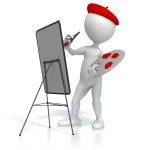 Click on one of the Arts~Crafts hobbies on the side to get started. Remember when you were in elementary school? Everyone had a chance to express themselves with crayons, paint, clay or whatever the teacher was willing to clean up. Whether you are an accomplished artist or just wondering if you still have the talent that you had way back then that made your mom so proud, it’s time to get back into the arts. Arts & Crafts are a great place to begin your hobby search because there are so many resources to help you. If you are searching for a hobby to turn into a business, this area is very easy to produce goods to sell. Also, your unique creations can be given as gifts and because you made it, your end result will bring you joy as well as the others that you share it with. There is so much support depending on the craft you select, because we cannot wait to see, receive or buy what you are going to make! If you can think any arts or crafts that I have left off the list, please enter it in the comments below. Yes really I agree with you that every person have an artist inside, the thing is only we need some platform and a point where we can express our talent.